Electric Heat Drying System. Powerful, portable and safe. BTUs wherever you need them – providing up to 62,000 BTUs of instant heat to speed your drying – that’s750 CFM with an 80oF temperature rise. 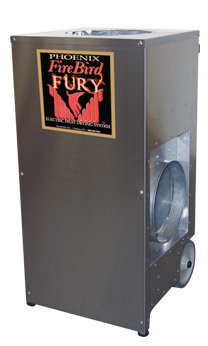 The FireBird Fury offers multiple heating, ducting and electrical options for on-demand heating from inside or outside the drying space. 12/30/50 Amp/115/220V operation. Two 8ft. cords w/4 pronged outlet and Phoenix Thermostat with 25ft. connecting wire are included. 105lbs.